This page contains a listing of books related to Kaze no Tani no Naushika (Nausicaä of the Valley of Wind). You can order these books through anime import stores listed in our Shopping Guide, though some of these titles may be out of print. If you have additional information on any of these titles, information on any titles we missed, or scans of any of the covers, please let us know. COMIC BOX is "Japan's only critical information magazine specializing in Japanese manga (and anime, to a smaller degree)". The five articles which make up this issue are available online at the COMIC BOX website. The issue is in both Japanese and English (the Japanese contents are translated into English). The web page hosts the English version only. A critical review work of the "Nausicaä" manga. An English translation of the book is currently being done. sec. 1 Origins of manga "Nausicaä"
sec. 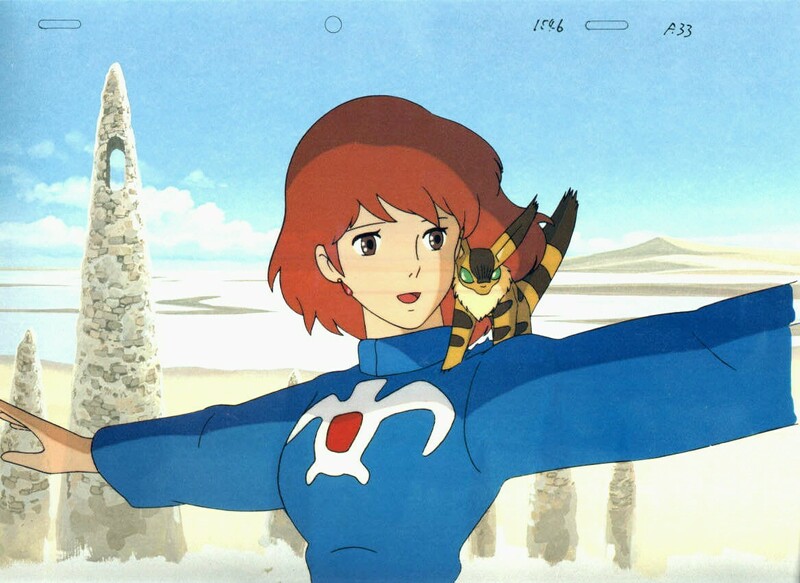 1 A story of manga "Nausicaä"
sec. 2 Between animation "Nausicaä" and manga "Nausicaä"
Chapter 3 - "Suicide" of "Nausicaä"
sec. 2 What is to guard 'the World'? sec. 3 The limit of love? sec. 2 Is it possible to re-remember? You can also read a description of the contents by the author from November 1996. "Yomu" (Yom) is a book review magazine. To commemorate the conclusion of the manga, this issue featured an interview with Hayao Miyazaki, a manga-movie comparison, and more. 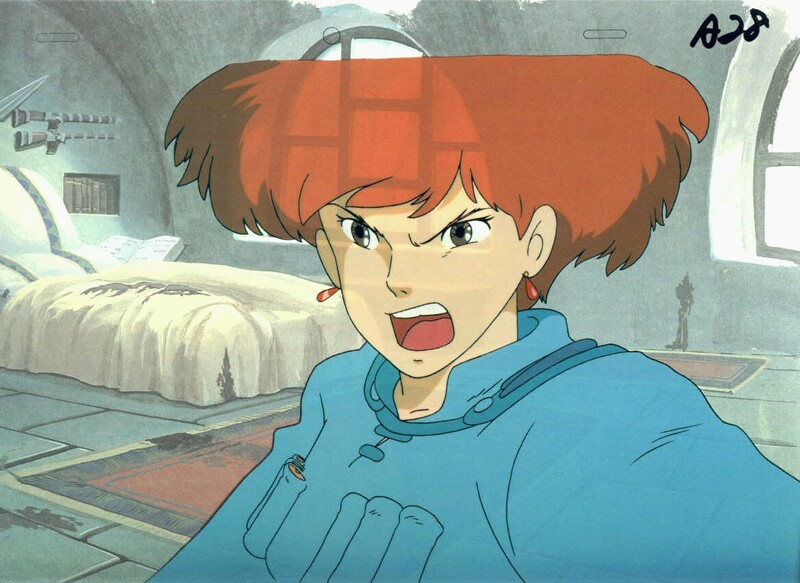 The cover was illustrated by Miyazaki. English translation of the Japanese version. Hard cover with storybook-style text accompanying pictures from the film. Pictures are fairly large and nice to look at. This is the English translation of the Japanese edition of this book. Same as the Japanese film comics. Same as the Japanese "Art of"
Film Comics. Basically color manga made entirely of cel setups--there's no additional art beyond that in the film--with the complete dialog for the film (sometimes minus an occasional background line) in the word balloons for the manga and overlays of the usual manga sound effect words. Different from the film comics published by Koudansha in 1984. Click here for a picture of the back covers. Basically color manga made entirely of cel setups--there's no additional art beyond that in the film--with the complete dialog for the film (sometimes minus an occasional background line) in the word balloons for the manga and overlays of the usual manga sound effect words. Paperbound but printed on high quality glossy paper. It contains a variety of sketches, storyboards, background information, and cel reproductions (with backgrounds). 309 pages (vol.1), 277 pages (vol.2). Bunkobon size. 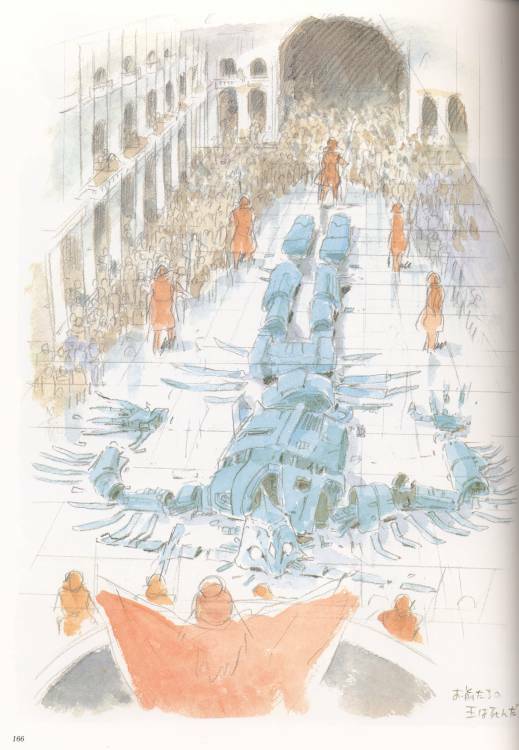 Contains 330 color illustrations from "Nausicaa." The first third of the book features illustrations used for posters and manga covers. Next to each illustration is commentary by Miyazaki. The second third features imageboards for the movie. 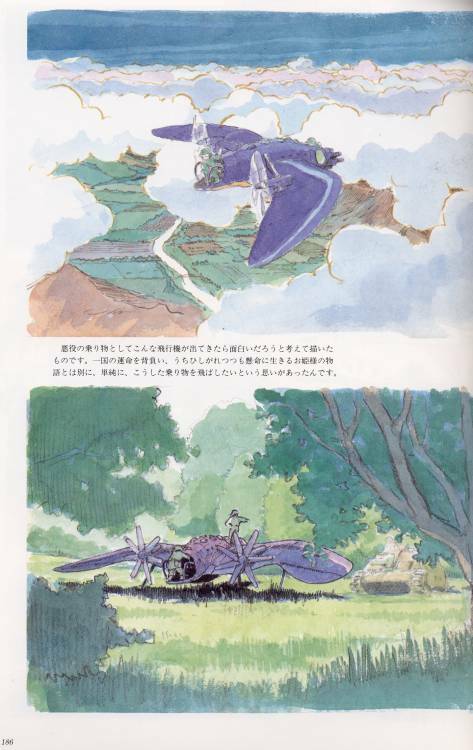 The final third features a seven-page interview with Miyazaki followed by 46 pages with over 190 concept sketches. 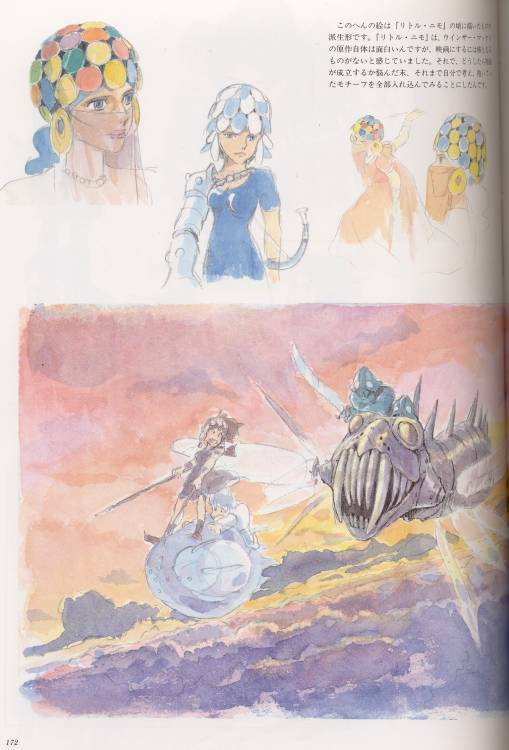 These sketches provide a fascinating window into Miyazaki's preliminary ideas for the Nausicaa saga. Amidst this treasure trove of discarded and unused ideas are experimental costumes and vehicles, prototype ship designs, and bits saved for later movies. 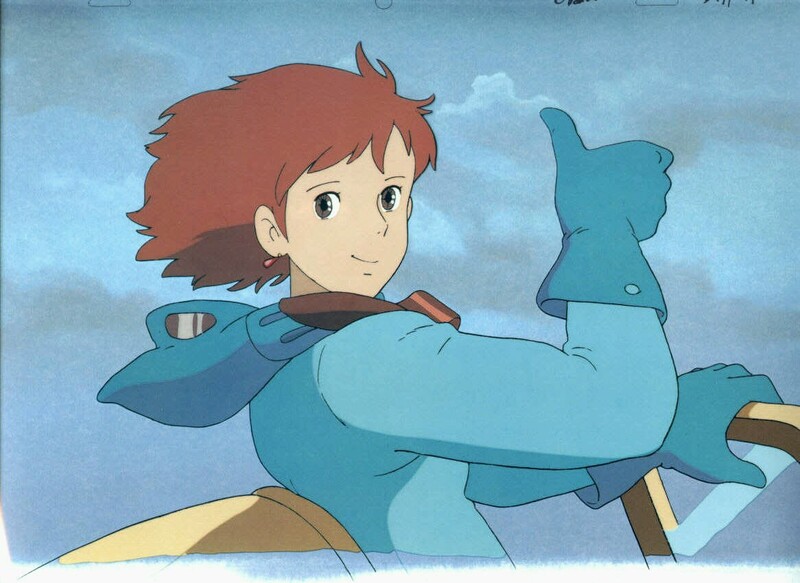 Extra bonuses: a guide matching Animage issues to the Collected Volumes, a reprinted diagram from the Japanese edition not published in any of the English translations, and four autobiographical cartoons about creating Nausicaa. (Two cartoons and their rough translations can be see on Marc Hairston's web site, -- The first one is located about a fourth of the way down the web page, the second is about half way down.) 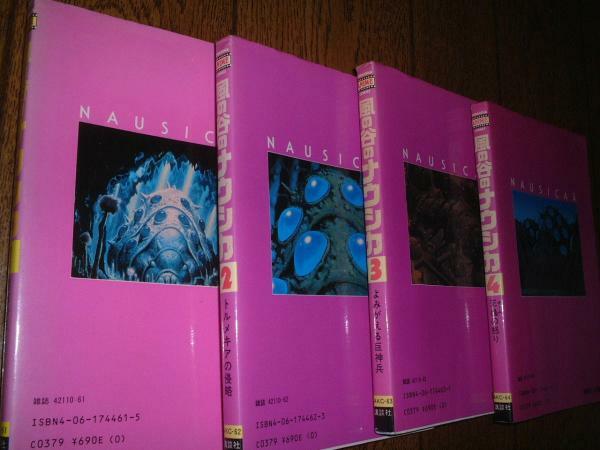 Under the dust jacket, the book's cover displays eight Animage magazine issues that featured Nausicaa on the cover. Softcover, 30 x 23 cm (12 x 9 inches), 208 pages. The picture on the top and the information above is for the AM JuJu book, and the picture on the bottom is an insert included with the March 1986 Animage. Perhaps they got a lot of interest in the insert, so they expanded it into the book. The insert has no ISBN. The AM JuJu book is 157 pages. Contains a "Film Story" (using scenes from the film), pictures and interviews with senior cast and crew, concept art and pencil sketches (like those in "The Art of..." books), a page on Top Craft (including some info on "The Last Unicorn"), a Fan Art Gallery, music scoresheets and lyrics for both opening and closing credits, and a "Nausicaä Goods" section showing off merchandise. Also contains a complete production staff listing. Hard cover with storybook-style text accompanying pictures from the film. Pictures are fairly large and nice to look at. There is an English translation of this book. 111 pages each. Songs from the Image and Symphonic Albums. Much better arrangements then the Doremi edition.